Volume alert! The beginning clip is musically intense, so mute the clip initially (It is on YouTube, which does that initially), or maybe start with medium-low at first. A quick note to people actually reading more than one post (Hi!). You’ll see a reference to Charybdis at the end of this clip. How… Hitchcock of me. My hope is that this video and text may be useful to people diagnosed with bipolar disorder. “Yes, this is something that I have experienced. What does that mean and what can I do about it?” Perhaps those who are experiencing these extremely stressful and dangerous moods can share with loved ones. “Here, look at this. This is what it feels like.” And if some daring mental health professional is wandering by this might supplement the dry textbooks. For those of you unfamiliar with abnormal moods, you can begin to understand bipolar irritability by imagining the following situation. A dear loved one has just died, an incompetent coffee bistro left you with a very bad caffeine jag this morning, and now you are stuck in Friday late afternoon rush hour traffic with an accident up ahead, no exits ahead for several miles, and drivers around you who are beginning to exhibit definite signs of road rage. There are two ill-defined but important mood states that are associated with Bipolar I and II disorders. To describe this with psychiatric precision is not the goal of this post. (Boring, been there and done that). 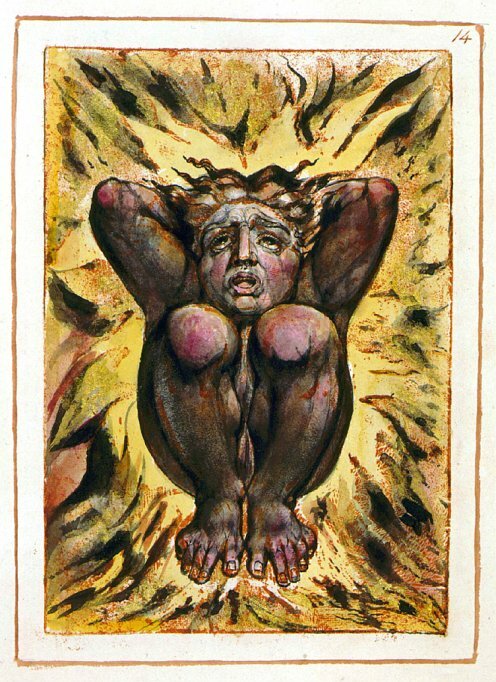 But some description is warranted because not everyone reading this will understanding what a mixed episode is (experiencing symptoms of both mania and depression simultaneously) or why the simultaneous experience of depression and anxiety (often accompanied by agitation) is important and dangerous. The first [more] dangerous mood used to be called a “mixed episode” in the DSM-IV nomenclature. 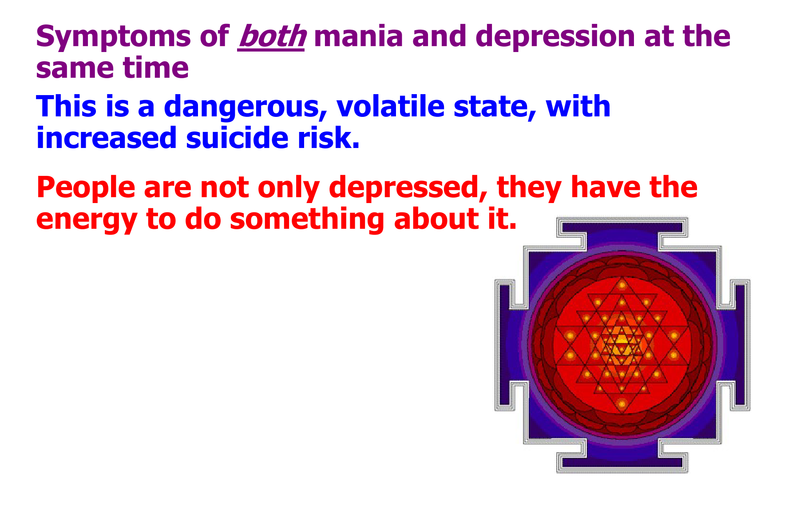 The person had to exhibit symptoms which met the DSM criteria for both mania and depression at the same time, or met criteria for both mood in a short period of time (one week). Because this episode had to meet criteria for both mania and depression, technically this mood state could not be diagnosed in Bipolar II because these individuals did not experience full-fledged manic episodes, only the milder hypomanic episodes. But the idea that someone can experience both “manic” symptoms and “depressed” symptoms either simultaneously or within a short period of time still applies. If someone “only” met criteria for hypomania and major depression at the same time they could not receive meet the criteria for a “mixed episode,” only a milder variation. There is an addendum at the bottom of this blog post that describes these criteria in detail for those who are unfamiliar with the criteria or want to refer back to them. And how can someone experience both mania and depression simultaneously? This question stumped undergraduate students more often than not. I remember vividly trying to teach this concept to upper division psychology students, because their reactions were befuddlement and confusion. Typically met the idea with either incredulity or by whining (will this be on the test?). “But Doctor [Summersday] how can someone be up and down at the same time?” In retrospect maybe I should have refered them to a Zen master who could have taught them about the fact that things are not usually this or that, but instead they frequently involve both. The simple answers to the question “How could you be both manic and depressed at the same time?” are (1) you only have to meet some criteria for each mood state and (2) “it doesn’t have to occur simultaneously, but within the space of one week.” That softens the criteria. When you parse the criteria, keeping in mind that “you only have to meet some criteria” and imagine the“irritable” mood states that I am attempting to convey in words, images, and music, it is easy to see how these mood states meet the diagnostic requirements. Also, the DSM-IV relaxed this requirement by only requiring the “up and down” criteria to both be met within a one week period. Which made it easier on psychiatrists to justify the diagnosis, but IMO clouded the issue with rapid cycling. The psychiatric community buckled under to the conundrum (perhaps knuckling under the weight of too many undergraduate students whining about how to resolve “up and down at the same time. 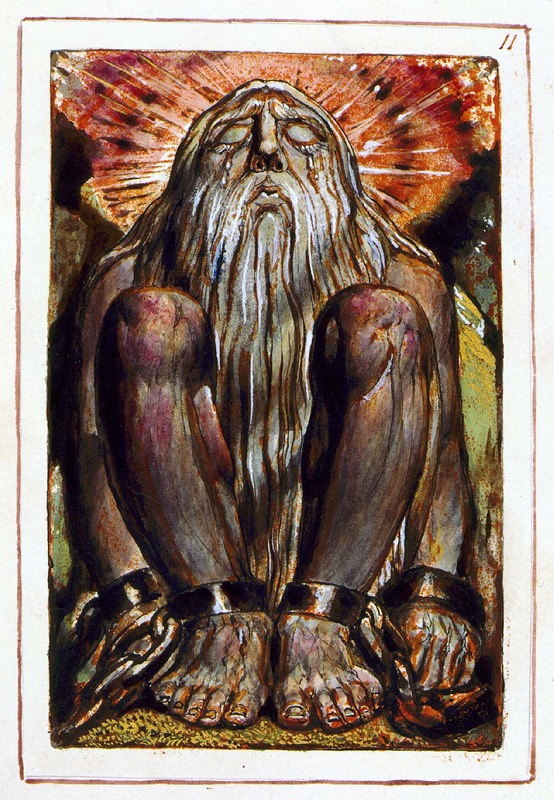 ” In the newest psychiatric diagnostic bible, the DSM-V, they no longer tries to describe it in that way. But I don’t want to drown in a morass of technicalities and digressions. So to reiterate, someone with bipolar disorder sometimes experiences symptoms in both group A (manic symptoms) and in group B (depressed symptoms) to warrant a diagnosis. The simplest way to warrant a diagnosis of “mixed state”would be to have rapid cycling, in which the person experiences both a manic and a depressive episode in a short period of time. The more interesting case is when a person in fact is up and down at the same time, exhibiting symptoms of both mania and depression. Before continuing, for readers who are less familiar with these ideas or need visual illustrations, here are three slides that I created for a lecture in which I described to students what a mixed state could look like. There is a link to a decent description of the symptoms, diagnostic criteria, etc. for Bipolar I and II disorders at the end of this post. A tedious footnote about DSM-V and mixed episodes. 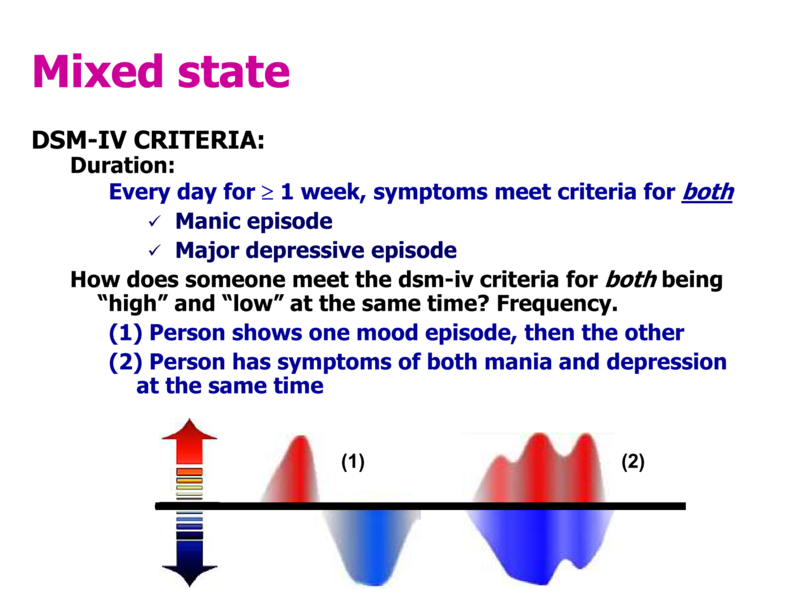 The DSM-V eliminated criteria for a “mixed episode.” Instead, a manic, hypomanic or depressive episode can be specified as “with mixed features.” You can consult the DSM-V for the definition of mixed features. Also, when they threw out the idea of “mixed episodes” altogether (which previously meant that only Bipolar I could warrant that diagnosis), So until the DSM-V those of us diagnosed with Bipolar II could not be included, but now they can be diagnosed with mixed features. Lucky for you, welcome to the club of us walking on dangerous ground. For those of us that like to occasionally dip our toes into the technical deep waters, here is a description of research about mixed episodes, and the DSM-V.
What is comorbid depression and anxiety (and why is it important)? At least a mild form of this mood state is familiar to us all. There are many examples. You break up with your girl/boyfriend (depression) and have a vague sense of panic about future relationships (anxiety). You lose your job (depression) and can’t find another, running out of money (anxiety). Your spouse dies (depression) and you find out that they had frittered away your retirement savings (anxiety). 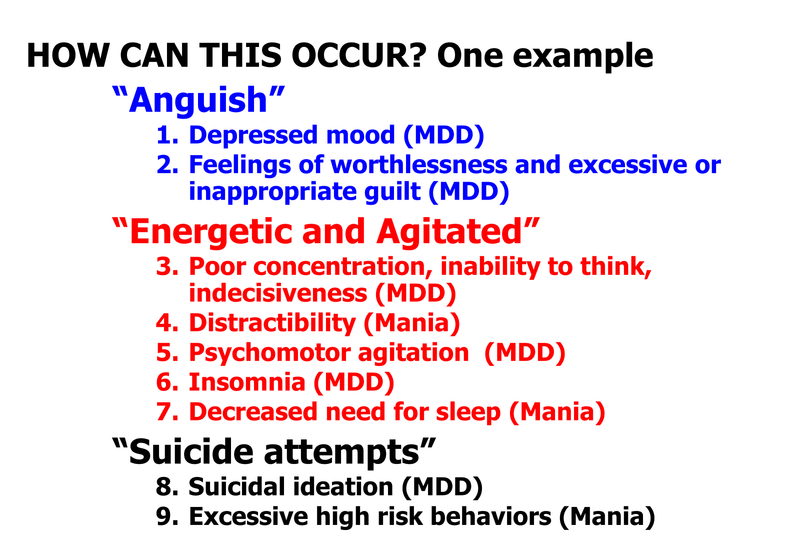 Although we all recognize it, let me emphasize that in Bipolar disorders these mood states are much worse. Thus the more than slightly preachy section up next about the fact that we do not suffer equally. But first here is an article written by a psychiatrist for laypersons article about the combination of depression and anxiety published from the National Alliance for Mental Illness. There is a vapid truism which states that we all suffer equally. Some of us suffer a lot more than others do. It is an empathic failure to believe otherwise. Speaking personally, I lost the love of my life at the age 21, when he had a bicycle accident and died after a month in the ICU. That I would rate as the worst experience of my life, maybe an “8” on the loss index. It was maybe an 8.5 because I found suicidal writing in his room which brought into question what exactly happened. Yes, it was in fact an accident, but he was courting death by racing at high speeds, at night, in hair pin turns. It was our collective loss that a jogger chose to be running in the middle of road, at night, with no moon or street lighting. I don’t rate my experience a “10” because I know that I might hit some bona fide 9s or 10s in old age. But it was simply a horrible experience. I relate this incident because of what I learned, watching his mother show up day after day, as I did. I came to understand that, however terrible that huge loss was for me, that the loss of a child was worse. And I learned that no matter how I tried to empathize with her pain, the pain of losing a child is a unique personal hell that I did not truly understand. It was better for me to acknowledge the depth of another person’s suffering and not quibble that “we suffered equally.” Yes, we both suffered, terribly, but her suffering was the greater of the two. That realization was helpful because I cut her more slack than seem warranted and, when there were ill tempered confrontations because of the amount of stress that we were under, I was inclined to let her have her way, even when I truly didn’t want to. More recently, at the moment I have back problems that are similar to a friend who had back surgery last week. She had an operation that I will probably undergo at some point. We are experiencing similar types of pain (in this case sciatic nerve pain, no joke). But she had an automobile accident ten years ago which she barely survived. Same pain yardstick, but she has a “8” on the scale while I rate mine currently at “3.” Best for everyone, myself most of all, if I acknowledge the difference in experience. All of this is meant to be taken in support of the fact that “anxiety, depression, and agitation” with respect to bipolar I disorder can reach a high of “10.” But for normal folks, although you may have experienced something in that direction, you will only, thankfully, experience a “5”. What then is a dangerous cocktail of anxiety, depression, and agitation? Whenever you take clinical depression and combine it with a state of high anxiety or manic agitation, you produce someone who is deeply distressed, depressed, and has the energy to do something about it (i.e. commit suicide). Here is a relatively good and simple description of symptoms and diagnostic criteria from a site that I’ve referred to for some time. The DSM-V is not for the faint of heart or easy to browse. Alright I am hypomanic right now for at 3 days now but, the week before I was so angry and out of control and my migrant put me in bed for 24 hrs. I always think I’ll see it know what’s going on maybe control it..
Lol I know my coworkers think I’m on meth or something I can’t control my manic. It’s been awhile at least for this long. I have completed many things this week but I cat breathe, focus on normal job and I been up for 3 days with may be 3 hrs each day and I forget to eat my body aches and I lose time. Um sovinbmy head I always hope I’d live to be manic again to get something done but the damage control after is exhausting.